Firefighting | Siller Helicopters, Inc.
Siller Helicopters provide firefighting support for a variety of government agencies including Exclusive Use Contracts with the U.S. Forest Service (USFS) and the California Department of Forestry and Fire Protection (CAL FIRE), as well as other state Departments of Forestry. 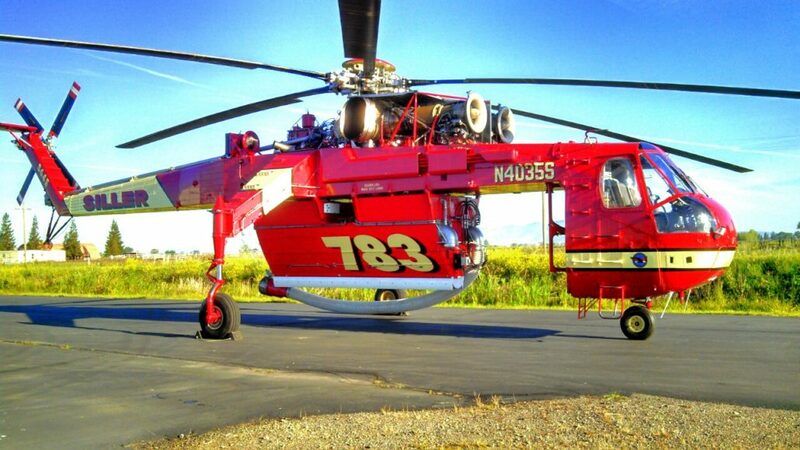 Our Sikorsky S-64E Skycranes are equipped with fire suppression tanks capable of holding up to 2,650 gallons of water and the Sikorsky S-61V model employs a 1000-gallon fire suppression tank. In addition to the suppression tanks, all aircraft are capable of utilizing long line buckets.